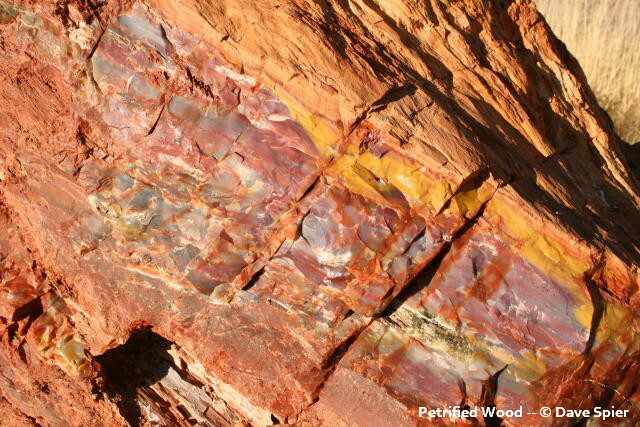 Petrified wood is actually a fossilized replica of the original tree, sometimes down to such minute detail that the original cells and wood-grain can still be seen. It’s formed by the gradual replacement of organic matter with agate when hot, silica-bearing water percolates down through the rock layers containing the buried logs. The silica comes from volcanic ash deposited after the trees died. 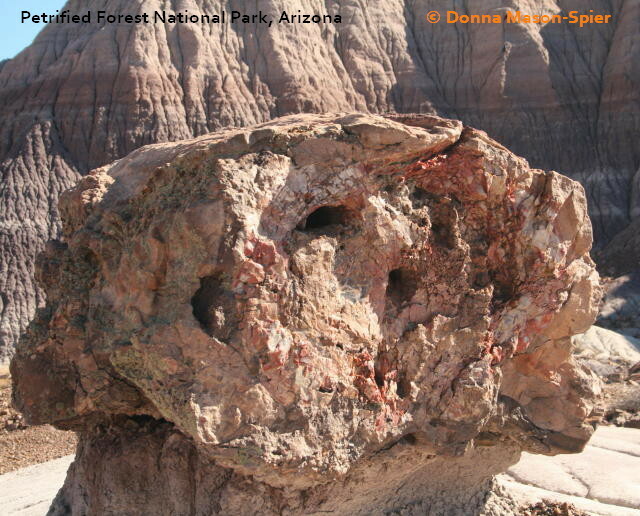 Incomplete mineralization allows the woody structure to remain visible. Agate is a cryptocrystalline form of quartz, meaning the crystals are so microspcopic that they are hidden. Chalcedony is a more general term for micro-crystalline quartz that includes agate plus the minerals carnelian, chrysoprase, onyx, and sardonyx. 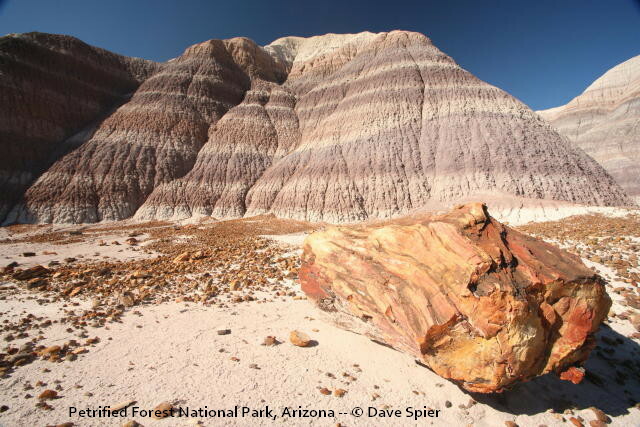 One of the most famous places to see petrified wood is the Late Triassic paleo-ecosystem preserved in the Chinle Formation at Petrified Forest National Park straddling I-40 east of Holbrook, Arizona. The National Park Service has an offical website and a map. 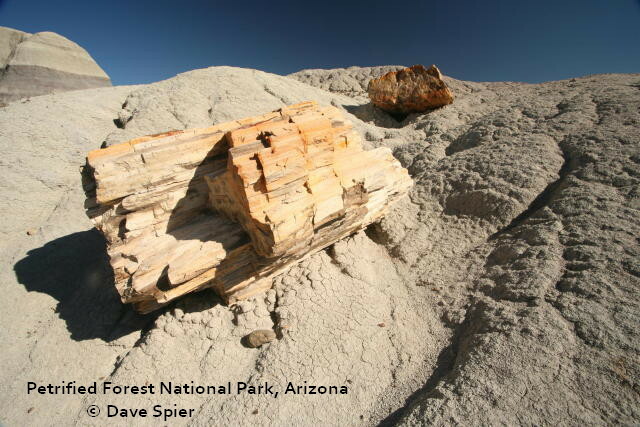 The petrified forests in the park were actually log jams on a river that flowed through Arizona during the Late Triasic period over 200 million years ago. Isotopic dates range from 211 mya in the Black Forest Bed to 218 mya in the older Blue Mesa layer. The trees at that time were conifers, gingkos and tree ferns. So far a dozen species have been described. The area was likely near the equator at the time and the trees grew continuously without marked rings caused by seasons. When they died, some of the trees could have been approaching a height of 200 feet. Corrections, comments and questions are always welcome at northeastnaturalist@yahoo.com Related topics can be found on the parallel blogs http://northeastnaturalist.blogspot.com and http://adirondacknaturalist.blogspot.com/ Also, you can connect through my Facebook photo page at Dave Spier (photographic naturalist) or my personal page, Dave Spier (northeast naturalist). 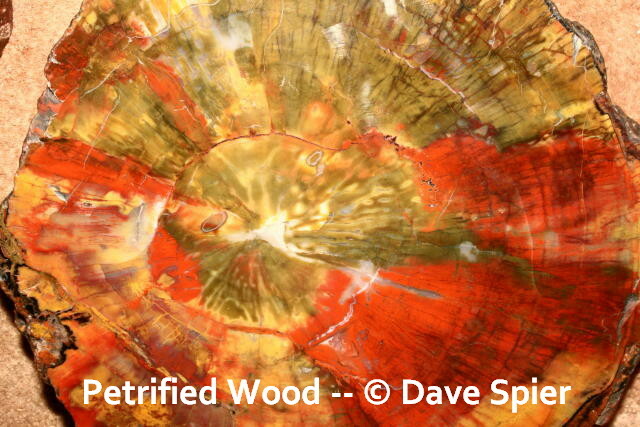 This entry was posted in geology and tagged agate, Arizona, Chinle, Formation, geology, Painted Desert, Petrified Forest, petrified wood, quartz, sedimentary.